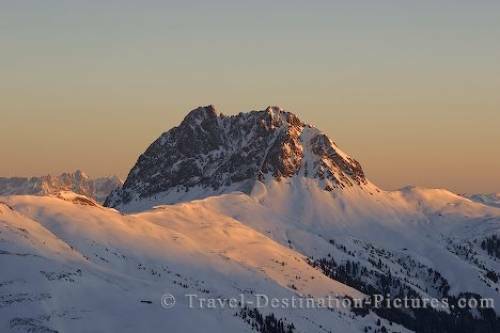 The beautiful scenery atop a mountain at sunrise in Austria, Europe. To experience a sunrise on top of my favourite ski mountain at 7 in the morning in February I had to come up with some new ideas. After checking the possibilities of getting up on the mountain as early as that I found a local worker who took me up with a Skidoo at 6 am. After half an hour on a blaring Motorslide with 60 mph and more uphill I was left alone in a perfect quiet and solemn surrounding and views like this. Picture of the scenery surrounding a snowcovered Mountain near Pinzgau in Austria, Europe.